Lance Corporal John Joseph Kerney N347294 Enlisted in the Army on 21 Jun 1942 at Katoomba New South Wales. He Remained in the Army until discharged on 30 Sep 1945. His posting at discharge was with1 9 Battalion Volunteer Defence CORPS Part Time Duty. This is a summary of the Military service of John Kerney during World War II. John Joseph Kerney is buried at Rylstone General Cemetery, Rylstone, New South Wales, Australia. He is the husband of Enid Cathleen Kerney (nee Wilson). [S32] Veteran Affairs (Reliability: 3), 1942. [S4] NSW BDM, New South Wales Government (Reliability: 3), 1977. [S60] Australian Cemeteries Index, http://www.australiancemeteries.com/ (Reliability: 3). 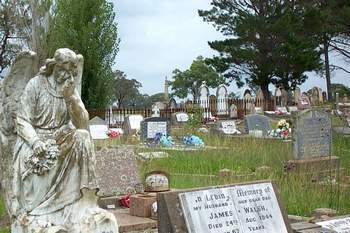 [S59] New South Wales Cemeteries Inscription List (Reliability: 3).